My Imperfect box came yesterday and I got a fennel bulb. I love fennel and want people to cook with it a lot more so it becomes more common and less expensive. This time I made a grilled cheese sandwich using some of the 5 pounds of kale I got from the Oregon Food Bank’s Harvest Share. I put a cast iron skillet on the stove over medium heat and added 1 tbsp of olive oil. While it heated, I used a mandoline to thin slice a medium-sized yellow onion and the small fennel bulb. I tossed the thin slices in the skillet, added a bit of salt, and sauteed until tender. Meanwhile, I chopped up about 2 cups of raw kale. I pulled the leaves off the stems, rolled to chiffonade. 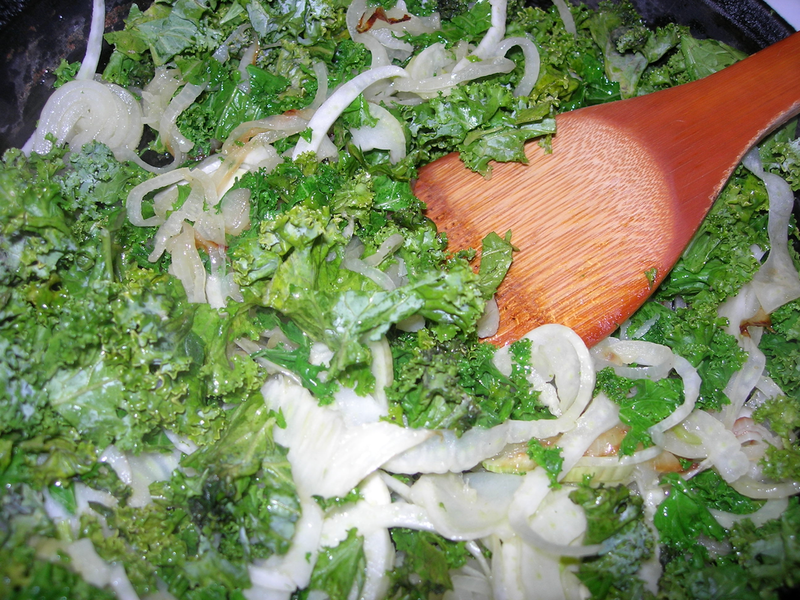 When the onions and fennel began to caramelize, tossed in the kale and covered to let it cook for about 5 minutes. I removed the veggies from the skillet and dropped some butter, putting down one slice of whole wheat bread, I added thinly sliced sharp cheddar cheese and then forked some of the veggies on top of the cheese. 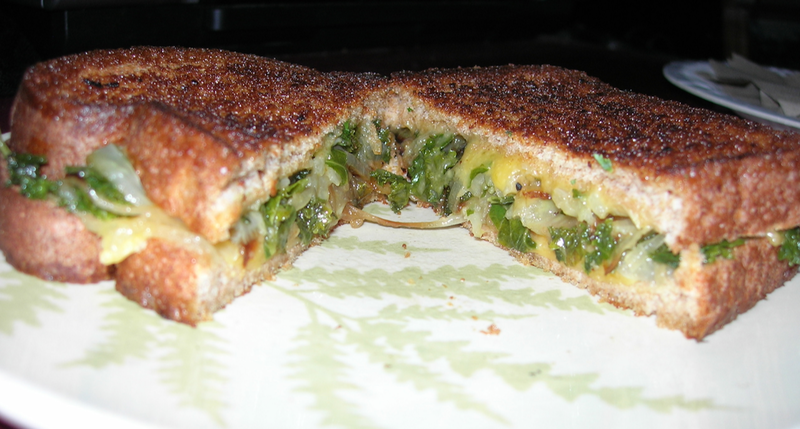 When it was toasted and ready to flip, I added some more cheese on top of the veggies and added the second slice of bread and flipped the sandwich. In a few minutes, it was beautifully toasted. So, this has an unctuous kind of savory deliciousness. People think of fennel as sweet, but it’s not and when it’s cooked it mellows even more. Kale is best with strong contrasts and fennel is ideal.